Following the final day of week-long skiing and snowboarding big air action in front of the cameras, it is now time for the public to vote and decide who will be crowned the 2010 Toyota One Hit Wonder Down Under ski and snowboard champions. 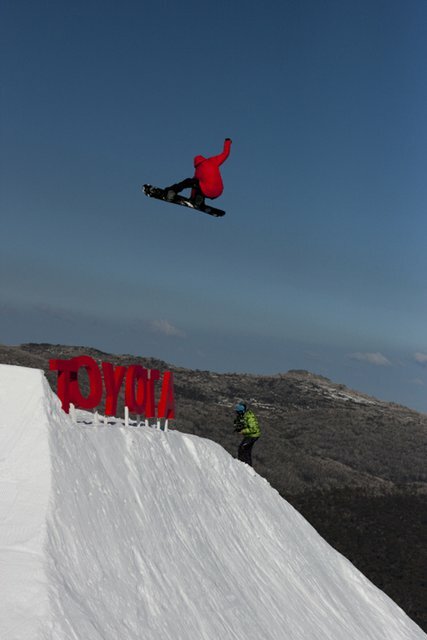 On the final day of filming, Thredbo played host to some of the most impressive &lsquo;one-hits&rsquo; the Southern Hemisphere has ever witnessed, as well as numerous personal best performances. Jindabyne local Jesse Houghton, the youngest competitor at just 17 years of age, unleashed a dizzying display of double front flips, stylish flatspins, and a huge flatspin 1260. Johnny Lipzker landed a switch double cork 1080, and Charlie Timmins was not to be out-done. &ldquo;The jump was definitely the best it&rsquo;s been all week, and I&rsquo;m stoked that I landed a double cork 1260 mute grab. Competing in the Toyota One Hit Wonder is awesome. It&rsquo;s like you&rsquo;re just riding with friends, but you get to launch off the best jump ever built in Australia&rdquo;, says Timmins. McRae Williams continued to astonish, throwing down some of the biggest and most technical tricks of the event. He was also voted by his fellow competitors as the &lsquo;Red Bull Riders Choice&rsquo;, consequently pocketing $1,000 cash thanks to Red Bull. The snowboarders also gained respect from onlookers with consistent big hitters Andy Lloyd, Ryan Tiene and Billabong team rider Robbie Walker landing the most technical maneuvers throughout the week. Now that the filming component of the event has wrapped up, footage captured from each rider&rsquo;s best &lsquo;one-hit&rsquo; trick can be viewed online at http://www.onehitwonderevent.com/vote-win. 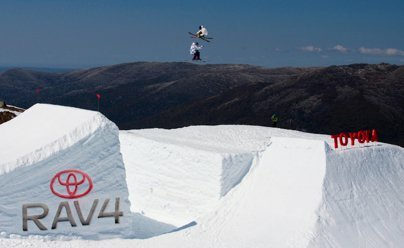 The general public has until the 10th of October to check out each big air trick, vote for their favourite and decide who will be crowned the 2010 Toyota One Hit Wonder Down Under ski and snowboard champions. By voting, consumers go into the draw to win the &lsquo;Ultimate Winter Package&rsquo;, including an all-expenses-paid holiday to Niseko, Japan for two valued at $6,200, thanks to Deep Powder Tours Ski Holidays, and a Salomon ski and snowboard equipment package valued at $3,800. Day Three was a Summary of Style from One Hit Wonder Event on Vimeo.